While I don’t like to waste time writing copy that isn’t going to be used, it’s just as important to overwrite then edit severely as it is to write succinctly. This is how you make your writing more effective and increase response. A most powerful way to write the best headlines is called The Jeff Dobkin 100 to 1 Rule. It’s the rule all copywriters use but don’t tell you about. It’s the unseen reason great copywriters get paid so much money: the first drafts, the 99 lines you don’t ever see. For every line whose contribution to success is so crucial, so pivotal that you place your bet of success on this single line; the one line that’s so significant that the success or failure of your entire direct marketing package, mailer, ad, or press release depends on it, say hallelujah; you must write that single line one hundred different ways, then go back and pick out the best one. Amen. Here’s the short version of that soliloquy: Write 100 lines, go back and pick out your best one. The 100 to 1 Rule. Hey, I didn’t say you’d like it — I just said it would make your writing more effective. Let’s take a closer look at where Dobkin’s 100 to 1 Rule is used. 2. The first line of your press release body copy. 3. Where else does the 100 to 1 Rule rule? The headline of your ad. Unlike a press release – where the headline has to conform to the editor’s need to fit in well with the rest of the editorial material, the headline for your ad is entirely up to you – so it can be more powerful and harder selling. Still, this recommendation may work for both press release and ad. Why is this a great formula? It attracts only the specific market segment the advertiser is looking for (here in our example, people who need to fix a leaky roof) – saving you $$$ on literature and fulfillment. Then it generates excellent response but only from highly qualified prospects by offering something for free. 4. The first sentence of the body copy of your ad. The only function of this first line is to keep the reader reading. It is NOT to sell your product. Your most interesting line is needed to entice the reader to read the rest of the ad. The rest of the body copy then sells the phone call by showing the product benefits and making a strong call to action. To hook the reader early, the first line must be electrifying. Yes… Write 100, pick one. 5. The teaser copy on your envelope. If this crucial selection of a great line isn’t perfection, your mailpiece goes right into the basket over which most people sort their mail. The sole function of envelope teaser copy is to get recipients to open the mailpiece. Unlike an ad or press release, you’ve already invested money to get your message delivered right into your prospect’s hands. Make a broader appeal with this teaser copy – you wouldn’t want anyone to get turned off by focusing it too tightly. 6. The first paragraph of your sales letter. 99% of my sales letters start with a first paragraph consisting of one or two lines. And most are only one or two words. The opening of a sales letter has to be the most electric it can be, because the reader makes the decision in a split second to read, scan, or toss. Keep the opening paragraph short and electrifying. One line is best. Two lines are OK. Three lines only work if the entire second paragraph is shorter than five words. Any way to circumvent the 100 to 1 Rule? No, not to any great extent. If you’re good, you may be able to get away with writing 25, 50 or 80 lines, then picking the best one. But the Jeff Dobkin 100 to 1 formula (originally appearing in his book UNCommon Marketing Techniques) is a sure-fire winning solution to finding that single explosive line to make your phone lines light up. The all-out winner may be that number 100, the 100th line you wrote. Of course it may be the very first line you wrote, too – but you’ll never know this… until you finish. Most times, though, you’ll know it when you write it. It’s that AH-HA, Eureka moment. 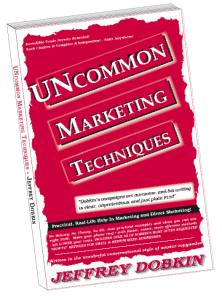 Jeffrey Dobkin has written over 300 articles and is the author of 7 books: 5 on direct marketing and 2 on humor. He still has a passion for writing and his advertising agency offers everything from a single direct mail letter to full tilt direct marketing packages. He also writes convincing copy for catalogs, and creates art and graphic design for brochures, direct mail and print advertising. On a deeper level Dobkin uses his 25 years of experience to write communication strategy plans for larger firms, marketing strategy for small to mid sized firms, and gives marketing advice to people that want to increase their sales and make their phones ring more frequently. Call him with questions or comments – 610-642-1000. While you’re sitting there… don’t just sit there, visit the store and buy something, or sign up for his free-spam email list! Thanks.